Buying the best external hard drive for your needs is essential, so our guide to the top external hard drives can help make sure you buy the right one for you. The reason why you'll need to think carefully when buying the best external hard drive is that you'll want something that can safely and reliably store your important documents, while also quickly and easily expanding the storage space of your PC, laptop or games console. 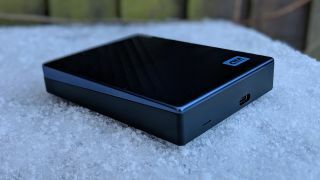 So, we've listed the best external hard drives money can buy in 2019. Each external drive on this page has been carefully picked to make sure it offers fast data transfer speeds – essential if you move lots of big files regularly – while also offering sturdy build quality so you don't have to worry about them breaking and losing your files. When buying the best external hard drive for your needs, there are certain things you need to take into account. For example, you'll want to make sure you have a drive that offers fast data transfer speeds. The biggest deciding factors when it comes to data transfer rates is the connection the drive uses, and whether it is a standard hard drive or a solid state drive (SSD). Many external hard drives use USB 2.0 connections, but for faster speeds you'll want USB 3.0 or ideally the newer USB Type-C connection. You'll need to ensure your PC or laptop also has a USB Type-C port. You'll also need to think about how much storage space you need. The best external hard drives offer a range of capacities. We'd recommend 500GB to start with, as that gives you plenty of space to store your files without costing too much money. However, if you deal in large files, such as high resolution photos and videos, then you may want to consider buying a bigger drive, with external hard drives offering terabytes (TB) of storage space. Buying the best external hard drive for your needs involves figuring out how much space you need. You don't want to buy an external hard drive that's too small, and end up running out of space, but neither do you really want to pay over the odds for storage space you'll never need. In this guide we list the best external hard drives with both traditional hard drives and faster (and more expensive) solid state drives. Still, the best external hard drives are also dependable and rugged, so you can safely store your data without worry. The best external drives will also be light enough to carry in your bag, with large capacities so that you can keep your data safe when travelling. There's a huge range of external hard drives on offer, so we've put together this list of the best external hard drives to help you find the perfect one for your needs. An external hard drive you can buy without breaking the bank, Buffalo's MiniStation Extreme NFC could be your match made in heaven. With compatibility for both Mac and Windows machines, the Buffalo MiniStation Extreme NFC is very flexible, and comes with a rugged case that's dust and water resistant, along with a built-in USB 3.0 cable. Not only is your data kept protected from knocks and drops with the rugged shell, but it's also got 256-bit AES security features and NFC (Near Field Communication) features as well. Essentially it allows you to unlock the drive to get to your files quickly and easily by tapping the supplied NFC card onto the drive's body. Pretty neat! The latest generation of the Western Digital My Passport Ultra range of external hard drives has landed, coming in sizes from 1TB to 4TB. It features cloud storage and 256-AES encryption, along with WD's own software suite. It is a good performer when it comes to data transfer speeds but doesn't come near the top of the leaderboard. Unsurprisingly, it doesn't reach the top speeds of solid state external drives, but for external hard drives based on traditional HDDs, this is the drive to consider. If you'd rather have an external hard drive that took advantage of solid state drive (SSD) speeds, then the Samsung Portable SSD T5 is definitely the best external hard drive for you. Samsung has a brilliant reputation for external SSDs, thanks to products like the T3, and the T5 builds on its predecessor by adding a fast USB Type-C connection that ekes out every last drop of performance from the solid state drive inside. Of course, it's also backwards compatible with USB 3.0 and USB 2.0 if your PC doesn't have USB Type-C. It's expensive, but it's well worth the cash. The Adata SD700 will suit those looking for a rugged storage device that can provide ample capacity without costing too much. It performs superbly well and remains the only SSD we’ve seen that is IP68 rated. Thanks to the solid state drive that resides in this external hard drive, it's a lot faster than external drives that use traditional spinning hard drives - so you're getting great transfer speeds as well as rugged protection. It also comes in capacities up to 1TB, so you don't have to worry about missing out on storage space just because it uses an SSD - this drive really does hit all the right notes. If you're looking for the absolute largest capacity external hard drive, then the WD My Book Duo 4TB is the one to get, offering a huge 4TB (you can also get versions with up to 20TB) of storage space over two hard drives. If you don't mind sacrificing some of the ample storage space you can set the drives up in a RAID array, so you have file backups of your files should one of the drives die. This USB 3.0 drive has many of the features of a fully-fledged NAS device (including a high price), and if you have a router with a USB 3.0 port you could use this as a network attached storage device in its own right. The device, which comes with two-year warranty, has 256-bit AES hardware encryption, and automatic backup software (WD SmartWare Pro). Worth noting that the enclosure used is fully serviceable and that WD ships the drive already pre-formatted for Windows users (NTFS). If you have a device with a Thunderbolt port, then this is a great option, as it provides twice the speeds of standard USB 3.0 drives. It's also not especially expensive compared to other Thunderbolt drives. The price is kept down due to its use of a traditional hard drive, rather than an SSD, which limits the potential speeds. It also comes with a USB 3.0 port for people without access to Thunderbolt. If you want to combine speed and capacity, then the Seagate Backup Plus Desktop Drive 5TB is definitely worth considering. It comes in a range of sizes up to 8TB and it beats the competition when it comes to read and write speeds as well. On top of this storage and speed, you get a decent amount of peace of mind thanks to Seagate's lower than average failure rates, especially in bigger capacity hard drives. You also get backup software, and the drive is compatible with both Windows and Macs, though it's formatted for Windows out of the box unless you go for a Mac-specific hard drive - though these are more expensive. Even if we had mixed feelings on past versions of the My Passport Wireless, the 2016 “pro” variant of the external HDD restores faith in the Western Digital name. The design, for one, has been overhauled and no longer resembles the My Passport Ultra or My Passport for Mac. Instead, there’s now a more premium feel to the My Passport Wireless Pro. It resembles an external DVD drive, but considering the onboard SD card slot, don’t worry about getting it confused with anything else. For photographers, this will make the Wireless Pro stand out. For everyone else, there’s a massive 6,400mAh battery built into the device. This lets the drive be used completely free of wires over 2.4GHz or 5GHz channels. When it’s wired up, however, don’t expect cutting edge connection tech, as the My Passport Wireless Pro uses only USB Type-B to Type-A. Completely absent is the latest and greatest USB-C connection. Where the My Passport Wireless Pro compromises on affordability, it’s able to benefit in just about every other area. Of course, not everyone needs a wireless hard drive or SD card support, but for those who do, it’s almost essential. You may have stumbled upon the LaCie Porsche Design Mobile Drive when perusing the Apple website for USB-C accessories. There’s a reason for that: the Porsche Design ships with both USB Type-C to Type-A and USB Type-C to Type-C connectors, making it a worthy candidate regardless of your setup. It’s expensive for an external hard drive, don’t get us wrong, especially if you’re in the market for the top-end 4TB option. On the other hand, this is an HDD that could theoretically output speeds of up to 5Gbps, if it weren’t hindered by the limits of SMR (Shingled Magnetic Recording) technology. Comprising five 800GB platters in a 15mm form factor, the LaCie Porsche Design Mobile is an excellent challenger to the Seagate M3, though it’s notably bigger in both weight and dimensions. Sure, it packs an extra convenience factor in the form of USB-C, but it should be noted that the Porsche Design Mobile is still limited to USB 3.0 speeds. Plus, even an aluminum finish can’t prevent it from clashing with your Rose Gold MacBook. Nevertheless, LaCie’s offering is the best USB-C external HDD money can buy, at least for the time being. Typically, iStorage hard disks cater best to governments and multinational organizations around the world, for good reason too – they offer tight security like no other drives around. If someone tries to tamper with your iStorage drive, you can configure it to self-desturct. What's more, the data is encrypted by the 256-bit AES protocol, with multiple forms of protection in place to ensure the bad guys don't get in no matter how persistent. When you consider all that extra security, the prices won't scare you away either. Sure, it's still expensive, four times the price of an equivalent 2TB drive, and unlikely to be the most nimble performer. But, you're paying for a product that's virtually uncrackable. Bear in mind, though, you'll get no help from the manufacturer if things go awry and you lose your password.